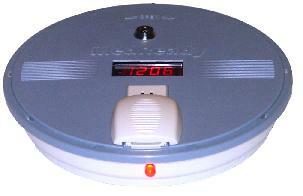 MedReady 1700FL Flashing Light Medication Pill Box Reminder Dispenser w/ High Frequency Alarm. The pill tray has 28 compartments that can be filled with medication. Each compartment is 1" x .5' x .75" and can hold pills of different sizes and combinations of sizes. When the alarm sounds, the tray advances allowing you access to the medication in that compartment. If you use one daily alarm, the tray is good for 28 days of medication dispensing. When the alarm sounds, the tray advances allowing you access to the medication in that compartment by sliding open the white window and taking out the medication. If you have any questions about this product, please give us a call (800)355-2956. We carry the complete line of MedReady products.